Vancouver Canucks forward Daniel Sedin prepares to play his 1,000th career game in a matchup against the Chicago Blackhawks, as a pair of Western Conference rivals renew their season series tonight. Listen to all the action live on TSN Radio 1040 Vancouver at 5pm pt. Vancouver (13-6-1) had won three of four before suffering a 4-3 shootout loss to Anaheim on Thursday. The Canucks, who fell behind 2-0 in the first period, scored three in the second before allowing the tying goal with just over eight minutes to go in regulation. "Every point's important. It's going to come down to the end, you're going to need every point you can get," coach Willie Desjardins said. "It was big for us to find a way to get one." Eddie Lack finished with 23 saves as Vancouver became the last NHL team to lose a one-goal game, falling to 7-1-0. The Canucks could turn back to Ryan Miller, who is 12-3-0 with a 2.74 GAA. He won his first five home starts before allowing all five goals on 23 shots in last Friday's 5-0 loss to Arizona. Miller could be out for revenge against the Blackhawks, who knocked him out of last season's playoffs while with St. Louis. He posted a 3.02 GAA in losing the last four games of that six-game series. Miller is 2-7-0 with a 2.96 GAA against Chicago since 2010. Crawford is 4-2-2 with a 1.59 GAA over an eight-game stretch in Vancouver, including the playoffs. Thursday's loss came at a high cost for the Canucks, who lost Dan Hamhuis to a serious lower-body injury. The veteran defenseman, who was logging almost 21 minutes per game, had six assists in 20 games. "It was a tough one. Hamhuis is a key guy," Desjardins said. Daniel Sedin is tied with twin brother Henrik for the team lead with 20 points, six of which have come in the last four games. Daniel Sedin has 12 goals and 15 assists over a 20-game stretch against Chicago, excluding playoffs. Daniel Sedin will become the third player to appear in 1,000 games for the Canucks, joining Trevor Linden (1,140) and Henrik Sedin (1,030). 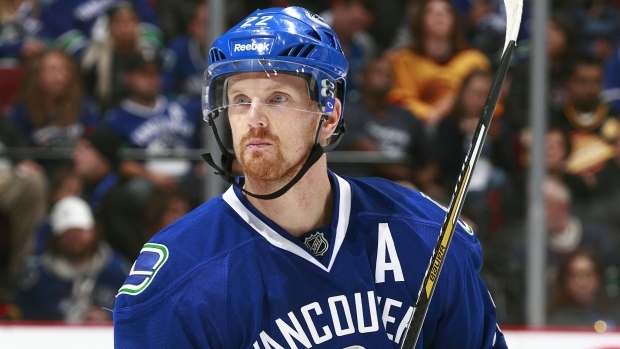 "It'll be emotional for myself, for sure," Daniel Sedin said. "To play this long for this franchise, it means a lot to you." Henrik Sedin has notched 16 points in his last 11 regular-season meetings in the series. The Blackhawks (12-7-1) improved to 2-0 on their six-game trip after routing Edmonton 7-1 on Saturday, their third consecutive win and fifth in six games. Captain Jonathan Toews scored twice and Marian Hossa racked up four points, giving him seven in the last three games. Marcus Kruger, Kris Versteeg, Duncan Keith and Patrick Kane also scored as Chicago posted its highest goal total of the season. "It's an excellent start to our road trip," said coach Joel Quenneville, whose team won 4-3 at Calgary two nights earlier. "I like the way we have played and the way we are getting our four-line rotation. We have got some momentum going right now." Corey Crawford finished with 24 saves, lowering his goals-against average to an NHL best-tying 1.90. He was slated to serve as Antti Raanta's backup but was thrown into action after Raanta fell ill.
Crawford has started each of the team's 10 games this month. "You have to be ready for anything," Crawford told the league's official website. "I have learned throughout the years that anything can happen." Kane has four goals and four assists over the last four games. He's tallied four and five, respectively, during a 5-1-3 stretch against the Canucks. The Blackhawks went 2-0-1 in the series last season, with both victories coming at Rogers Arena.